Elegance. Tranquillity. Safety. Courtesy and good manners. Persistence of matter and principles. Respect for time and words. Unobtrusive chic. In one word – classic! It is not true that the classic is the style of our aunts and grandmothers. The classic style is still popular and always will be. This style is rooted in warm, well-established rituals, creating family and friendship ties. The classic style can suit people of all ages – from children to seniors. It is subdued, quiet and safe. There is no place here for a bright extravagance. This is an implementation of the idea of a home in which our grandchildren will be able to establish a family. In the privacy of which you can always rest from the rush of everyday life. The classic style has many faces, but it always introduces elements of elegance and dignity to the interior. Trophy Brown collection of ceramic wood, Ceramika Paradyż. Natural stone and wood are the most traditional, classic materials. Because they are expensive and very demanding in care, nowadays they are frequently replaced with ceramics, perfectly reproducing their appearance. The advantage of this worthy replacement is the durability and ease of keeping it clean. The textiles are dominated by highly-refined natural fabrics (e.g. wool, cotton, linen) in subdued colours and patterns. A classic interior needs airy net curtains and heavier drapes, ensuring intimacy and elegance. It is said that the kitchen is the heart of a home – and it is also true. It is the living room, however, where we relax after work; here we have unhurried conversations, we listen to music, play board games, that became popular again, drink aromatic coffee, a glass of wine or cognac in a good company. The living room is the most representative area in a home. It is good to focus here on the nobility and high quality of materials, furniture, equipment and details. Good taste and moderation in the use of decorative elements are important in the classic style. It is to be cosy, friendly, elegant and comfortable. Below are some fresh examples of living rooms in a classic style. Parquet boards laid in a herringbone pattern are one of the most characteristic features of the style. Such a layout is timeless, visually appealing, but neutral enough that it does not draw too much attention and does not interfere with the harmony of the interior. Quite the contrary – thanks to its regularity, it creates this harmony, along with “silent” colours and shapes. Classic and modern at the same time. Subdued colours of the walls, floors, curtains and furniture are a neutral background for interesting conversations and relax of the household members. Interesting chandelier, resembling tangled mistletoe, perfectly matches the ceramic boards laid in a herringbone pattern. Foresta Beige Collection, Ceramika Paradyż. Wood laid in loose patterns is also a popular choice for classic arrangements. Pine boards with a warm honey hue and a distinct grain, arranged together in different layouts, create interesting effects. Comfortable armchairs covered with natural leather, a functional table and a white floor lamp, subtle pictures in simple frames, and a ceramic parquet – this is the recipe for a light, a modern classic. Pini Collection, Ceramika Paradyż. Using the same ceramic parquet on a terrace optically expands the living room and coalesces the whole space: interior and exterior. Harmoniously and elegantly. Pini Collection, Ceramika Paradyż. 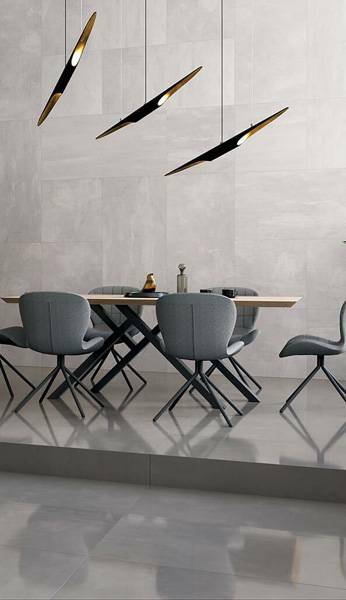 A similar, full of warmth effect can be achieved by using tiles with a slightly smaller format (40 × 40 cm), from the collection Legnetto Naturale, Ceramika Paradyż. Old, well-worn wood, endowed with a new life thanks to a deep revitalisation – this was the inspiration for ceramic boards from the Trophy collection. They are also perfect for a floor of a modern-day, classic living room. And finally, one more wood inspiration for a cosy living room – large panels from the Balance collection, brightened by the patina of time. Herringbone layout of boards, green velvet of armchair’s upholstery, simple elegance of the table – all this creates a warm atmosphere of a classic interior. Balance Collection, Ceramika Paradyż. The stone, like wood, is one of the oldest, most rooted in tradition finishing materials. Ceramic stone always looks noble. It can very closely resemble, among others, natural marbles, granites, sandstones or limestones. In classic arrangements, stone tiles are very important. Natural, slightly faded colours – mainly beiges, whites, browns and ashes, delicate textures and venation of living stones, are a perfect basis for decorating interiors in this style. Some stones can “hide” in their subtlety so well, that it takes a longer time to observe and reflect where the peace that the place emanates with comes from. 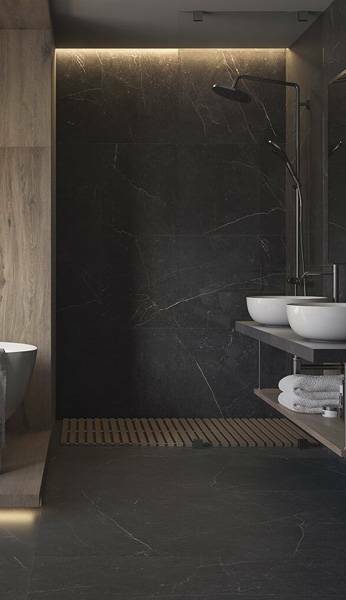 An example of such stone tiles is the Intero collection. Unified warm tones of colours, large formats (rectangular and square) give voice to people, furniture, equipment and details. Uniform, almost “absent” floor in the shade of a delicate warm beige, emphasises the beauty and quality of furniture and details. In this living room, time flows slowly and nicely, and tea always tastes exquisite. Intero Beige Collection, Ceramika Paradyż. For some, the classic style has to have features of exclusivity, expressed in dark and heavy furniture or dignified decorations. Here the floor is arranged almost like in a palace, in a tasteful pattern combining stone, wood and ceramic decor. The regularity of this composition is definitely noticeable; however, it does not overwhelm the living room and does not outshine the rest of the decor – on the contrary, it creates a stylistically coherent whole. 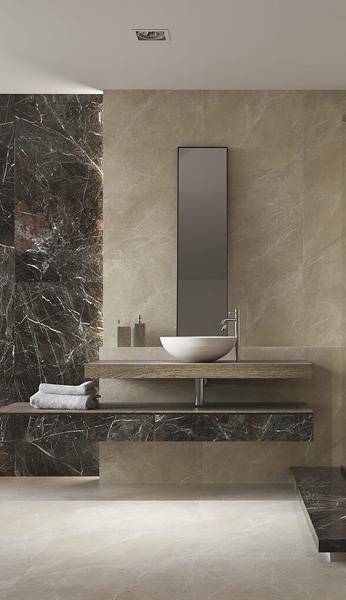 Natural venation of brown marble contrasts beautifully with the calmness of light wood and the nobility of pattern of a dark ceramic decor. The Middletown collection combined with elements of the Woodhaven collection (ceramic parquet boards) and Tremont (decors). All types of carpets make interiors cosier. However, if we do not like cleaning up non-uniform surfaces (or, e.g., we do not want the insulation effect in the case of an underfloor heating), we can try a ceramic carpet that will visually warm up the interior. Consistent use of shades from the same colour palette and a thoughtful selection of accessories will help to create a living room with a sense of order and security. A “carpet”, even made of stone, brings the feeling of cosiness to the interior. Traditional decor subtly adorns the whole interior. Pavi Collection, Ceramika Paradyż. 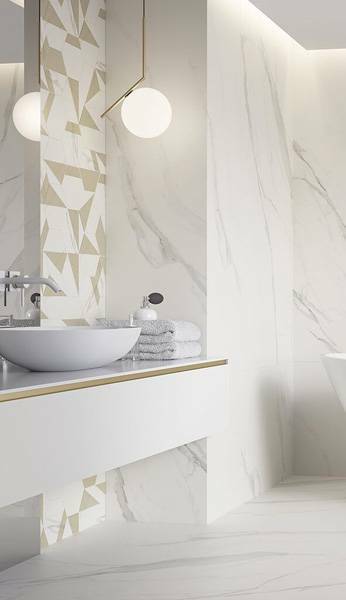 In modern arrangements, ceramics frequently accompany floors as a wall cladding, coherently combining both horizontal and vertical surfaces. This living room, furnished with modern technology, still retains a classic character with subdued colours, natural materials and balance of individual elements of interior decoration. Warm browns and beiges, interesting decorations in the form of cut ceramic mosaics on the wall and on the floor, leather and natural wood of furniture – all this creates a feeling of beauty and order. Taranto Collection, Ceramika Paradyż. When deciding on arranging a house or apartment in a classic style, we can confidently assume that we will feel good in it also in a few or a dozen years. And our guests, too. Because the classic lives its own, unwavering life, despite the clamorous, short-lived arrangement trends. After all, is there anything in that can be more important in a living room than calm, warmth, comfort and cordiality? How to decorate a living room in a rustic style? We have several reliable tips!